Are you looking for a simple high cholesterol diet and exercise plan to lower Your cholesterol fast? If yes, you probably went to your doctor and took a cholesterol test. And your doctor said that you have high cholesterol and need to reduce cholesterol immediately. More than likely, your total cholesterol is over 200 and you are suddenly concerned about your heart health as well as high blood pressure. Even worse, your total cholesterol might be over 230, 250 or 300. Now your doctor is recommending that you start taking statin medications to lower your risk of heart disease. While statins can be useful for people who refuse to change their lifestyle, statins, like most medications have common side effects. Read how Lipitor side effects caused memory loss to a doctor and former astronaut. When Dr. Duane Graveline, former astronaut, aerospace medical research scientist, flight surgeon, and family doctor is given Lipitor to lower his high cholesterol, he temporarily loses his short-term memory. Read about his traumatic experience here. Let's say that you are aware of the dark side of statins and want to treat your high cholesterol in a more natural way. So did I. When my doctor told me that my total cholesterol was above 270, I could not believe it. I had been following the Paleo diet, a paleo style eating plan for 10 months and my cholesterol went through the roof. I know that there are debates within the paleo and non paleo community about the dangers of cholesterol. And there are opinions that cholesterol is not the evil demon that causes heart attacks. Start your morning with a bowl of oatmeal. Forget about the processed breakfast foods. Oatmeal is not just a good breakfast, oatmeal is a great breakfast. You might be wondering how much oatmeal you need to eat to lower your cholesterol? The beautiful thing about oatmeal is, If you eat one-and-a-half cups of it each day, you can lower your cholesterol by 5 to 8 percent. Oatmeal contains soluble and insoluble fiber, two types that your body needs. Insoluble fiber, which is also found in the skins of many fruits, helps keep us regular. Soluble fiber, which is also found in beans, oranges, and pears, helps prevent disease and lower cholesterol. Add some blueberries, strawberries, banana and/or grapes to your oatmeal. You will have energy for hours. For protein, my preference these days is to use a non-gmo almond butter with no added sugar or a non-gmo peanut butter with no added sugar and no high fructose corn syrup. I had to hold off on all of the eggs I was having to lower my cholesterol. You have to see what works for your body, but for now, I'd either add nuts to your oatmeal bowl or a nut butter. My favorite oatmeal is Quaker's Old Fashioned Rolled Oats, you cannot get simpler than that. Would you rather take statins or eat your way to greater health benefits than you ever thought possible? You can usually find a lentil or bean soup in most restaurants if you do not pack lunch for work. Or of course, you can bring your own soup, such as this Mcdougall's black bean soup or this one from Goya foods. The Mcdougall's black bean soup is more convenient, but taste wise, I think Goya's is better, but you decide. If kidney beans or soup is not to your liking, how about sushi? You can pick up a sushi roll just about anywhere these days. I'd go with a vegetable sushi roll or sushi with salmon and avocado, but steer clear of the spicy tuna or spicy salmon. Of course, home cooked food is always the best. The easiest way to prepare a good lunch is with left overs from the previous dinner. So, if you had broccoli and potatoes with Branzini fish, you can leave a little over for lunch. The same with any dinner, just save some in a microwaveable lunch container and have the leftovers for lunch, easy. Last, if you like to have an easy sandwich, here is my favorite. Split open a defrosted sprouted grain Ezekiel muffin, whichever flavor you like best. Heat a griddle or non stick, non aluminum pan with 1 to 2 tablespoons of virgin olive oil, and place the muffin halves face down. Grill the muffin halves on medium low for a few minutes until they brown a bit. When they are toasted, you can add a slice or 2 of organic roast turkey breast with organic girl spinach, tomato, onion and an organic haas avocado. Spread some classic mustard on your sandwich preferably, or if you are a complete mayo fanatic, a tablespoon of organic Primal Kitchen avocado oil mayonnaise or worse, some Helman's is fine, but that is it! sweet potato, and you have your dinner. The main focus of your dinner should be making sure to have more green vegetables. This is not a common practice for most of us who grew up on a processed food diet. Usually our vegetables came from our frozen dinners, not fresh produce. Well, it is time to make a change. Your high cholesterol is begging you to make a change. Increasing your cooked green vegetable intake and replacing your heavy meat and chicken meals with fish is going to help. If you want some chicken or beef, fine, but realize that the best results will come from minimizing your consumption of animal protein. To lower my own high cholesterol required at least two and sometimes 3 different cooked green vegetables every evening for dinner. As well as cutting out meat, chicken and eggs. The main protein for me was fish. And in just 6 months, my high cholesterol of 270 was down to 160. Of course, if you can have cooked green vegetables in the daytime too, go for it. But the point is for you to make sure that you are finally binging on something worthwhile like broccoli. The main meal plan for dinner is 1 or 2 cooked green vegetables, at least 1 or 2 cups of each, with a lean protein and a whole food carb, like sweet potato, white potato, corn on the cob or ezekiel muffin. Time for you to both start eating and stop eating. This means that you need to have a real breakfast. No more bagel or muffin on the run. Schedule a breakfast, lunch and dinner for yourself. This way your body gets used to being fueled at regular times. And stop eating so much between meals. Many of us are used to skipping breakfast and lunch, and then eating a dinner that extends for hours, all night. A better approach to lower your high cholesterol is to spread out your calories through the day. Your heavier meals should be earlier in the daytime, when you need your energy, and lighter at night when you do not need energy, you need to go to sleep. To read more about the best diet to lose weight fast, see this. Your plan of action is to up the intensity gradually. For example, if you could walk 1 mile in 30 minutes week 1, then target walking 1.1 miles the next week or the next day, and so on. You need to demand a little bit more from your body each week, or even every workout. Chlorine is a very strong oxidizing agent. In rabbit studies, researchers have clearly demonstrated that drinking chlorinated water can cause atherosclerosis. The concentrations used in these studies were only slightly higher than the amount used by municipalities to chlorinate drinking water. It's no wonder that, after drinking chlorinated tap water all their lives, so many people just happen to end up with heart disease. This is about as simple as you can get. You most likely have high cholesterol because of lifestyle habits and not because you inherited it. Maybe you inherited your parent's habits of having eggs and bacon every morning for breakfast and swanson's frozen chicken pot pie for dinner. You know that you need a heart healthy diet and to avoid saturated fats. But, you still do not know what to eat. This high cholesterol diet plan answers that question will practical menu selections. Of course there are no guarantees, but I have seen this simple high cholesterol action plan work, for me and others. 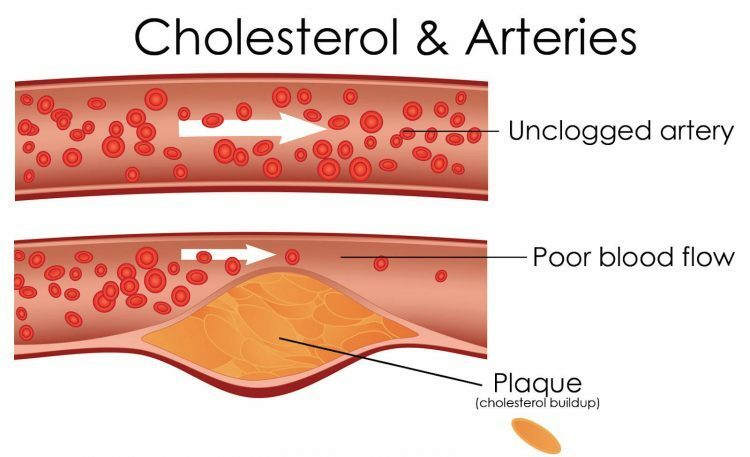 If you have high cholesterol, what is your strategy besides statins? And if you do lower your total cholesterol with this high cholesterol diet and exercise plan, please let me know.